Peter Farrelly (Dumb and Dumber, There’s Something About Mary) returns with Green Book, the charming, based-on-a-true-story tale of a successful black jazz pianist who hires a white man from the bronx to chauffeur him around the Deep South of 1960s America. The 17:50 screening on Mon 11 Feb will include Descriptive Subtitles and a short introduction from Roger Griffith, (Author, Broadcaster and Executive Chair of Ujima Radio), which will feature simultaneous BSL (British Sign Language) interpretation. Following the screening please join Roger for a post-show discussion with other audience members. The post show discussion, from 20:00, will take place in the Café/Bar and will feature simultaneous BSL (British Sign Language) interpretation. Set in 1962, it follows Italian-American Tony Lip (Viggo Mortensen), who is hired by world-class black pianist Don Shirley (Mahershala Ali) to chauffeur him on a concert tour tour through the Deep South. Don is aware of the troubles that he might face in different locations due to the colour of his skin and requires someone to act as both staff and protector. Tony isn’t an obvious choice as his views on race are problematic to say the least but he carries the required muscle and the unlikely pair embark on a road trip that’s bound to change both of their lives…Funny and moving, Farrelly boldly shows how he can nail not only comedy, but more dramatic tales too. With exceptional performances from Ali and Mortensen (they have an enchanting bond on camera) and having picked up the People’s Choice Award at TIFF, this story of race, class, and redemption is not one to be missed. Following the screening please join us for a post-show discussion with other audience members. The post show discussion will take place in the Café/Bar and will feature simultaneous BSL (British Sign Language) interpretation. 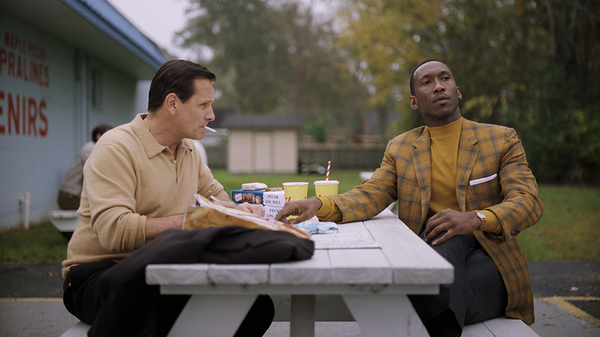 You’ll receive 10% off drinks with your cinema ticket – so grab a glass and let us know your thoughts about Green Book.